When Premier McNeil opens the Legislature on September 21, CUPE Nova Scotia will be there as part of a rally organized by the labour movement from across the province. Please join us! Along with CUPE National President Mark Hancock and CUPE Nova Scotia President Nan McFadgen, we’re going to send a clear message to the McNeil Government. We will defend our rights! We will not back down! Reserve your seat on the bus! Seating is limited. Please RSVP as soon as possible. CUPE members can reserve a seat on a bus. Please send an email to Nan McFadgen at nanmcf@icloud.com. 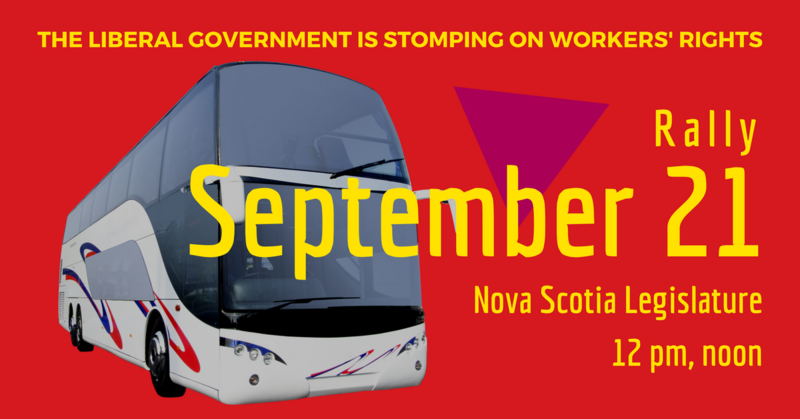 Updates will be posted on the website at novascotia.cupe.ca.